Portraits of five modern nuns in America. Venerable Thubten Chodron takes us on her journey from jeans and dangly ear-rings to crimson robes, and even offers a meditative approach to being stuck in traffic. Having studied Tibetan Buddhism in India and Nepal, she went on to found Sravasti Abbey in Washington state, and is the only nun to have co-authored a book with the Dalai Lama. 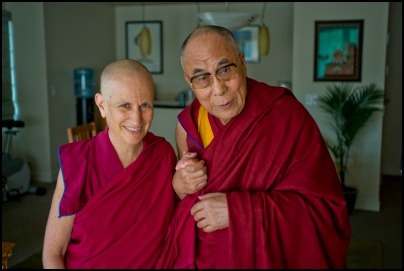 She explains why Tibetan Buddhist nuns shave their heads, forego perfume and tune out pop songs. Thubten Chodron is a Tibetan Buddhist nun, the founder of Sravasti Abbey, and the author of several books on Buddhist philosophy and meditation. "You look at all the other people in the cars, sitting there parked on the highway, and you think, 'All those people want to be happy and not suffer, just like I want to be happy and not suffer.'"